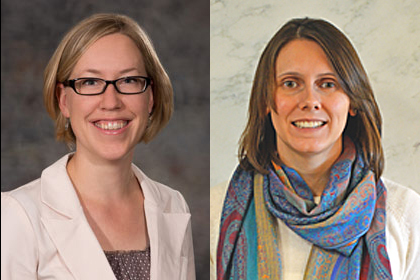 From left, Jenny Dauer, SNR associate professor, and Natalie Umphlett, High Plains Regional Climate Center interim director, were named 2016 Great Plains Fellows. The School of Natural Resources’ Jenny Dauer and High Plains Regional Climate Center’s Natalie Umphlett were named 2016 Great Plains Fellows. The Center for Great Plains Studies established the Fellows program to link scholars of the Great Plains, no matter their discipline, and to establish a means to share their work. Fellows are nominated only by other Fellows and are approved by the Center’s Board of Governors. In order to be nominated to be a Fellow, scholars had to presently hold a regular appointment at the University of Nebraska and had to be concerned with the past, the present and the future of the Great Plains. He or she had to present evidence of a research, teaching or public service commitment to the Plains region. Dauer and Umphlett both fit the bill. Dauer and Umphlett join five others named 2016 Fellows. The center also named nine new Great Plains Associate Fellows, or scholars from a non-NU institution.